• Cards do not have a hole punched for display on a peghook. 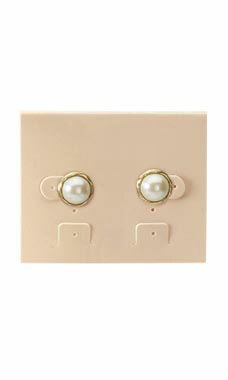 Tan Plastic Earring Cards are the best choice to display all types of fashion earrings. Earring cards have a lip on the back for attaching to jewelry displayers. Each card is plain without writing. The card has hole placement for post, fishhook and clip style earrings. The hole placement and tabs are spaced out 1/4" apart to allow for up to 4 pair of post earrings to display on one card.